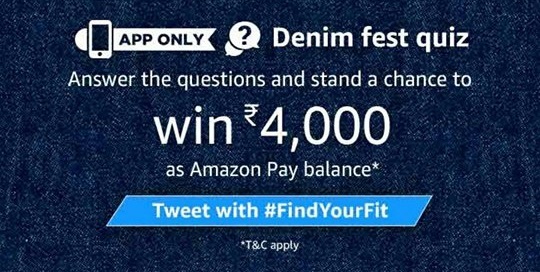 Amazon Denim Fest Quiz Answers: Participate & Win Rs 4000 Amazon Pay Balance (29th March)!! – Hello! Amazon is back with Daily Quiz and Contest and today’s i.e., 29th March 2018 Quiz is Amazon Denim Fest. Same as Last Amazon Pay Quiz, Participate by Answering Few Questions and get a chance to win Rs 4000 Amazon Pay Balance. We are also adding all the correct answers below, so go through them to easily participate. Hint: We have added the correct answers to each question asked in Amazon Pay Quiz Contest. Just check the answer and submit them accordingly to participate easily. 3. You will see “Win Rs 4000 Amazon Pay” or “Amazon Denim Fest Contest” banner. 5. Now Answer 5 questions one by one in the contest & If you answer all the quiz questions correctly, You will be eligible to win the prize (Check Answers Below). Q1 – As a part of the currently ongoing Amazon Denim Fest, what is the discount you can avail on jeans part of the event? Q2 – Which of these celebrities was associated with the brand Flying Machine in the past? Q3 – How many styles of Flying machine jeans can you find on Amazon.in? Q4 – Which of these phrases is associated with the brand Flying Machine? Q5 – As a part of Denim Fest, you can currently avail a 25% discount at checkout on jeans part of the Spring Summer’18 collection. 5. The draw of lots will be carried out during the Contest Period for the questions and a total of 50 (Fifty) participants will be selected as winners by a random draw of lots. A total of 50 (Fifty) participants will be selected as winners of the Contest. 6. The declared winner(s) will be eligible for winning Rs. 4000 as Amazon Pay balance each (hereinafter referred to as “Prize(s)”).